Stewed tomatoes with an Italian spin. Use basil diced tomatoes for soups, stews, pastas and more! I substitute my Basil Diced Tomatoes for plain diced tomatoes, unless of course basil and peppers don’t mesh well with the dish I’m making. I use them in soups, stews, over baked chicken, or sometimes I’ll just heat up a jar and toss with pasta if I’m not in the mood for a heavy sauce. In a large stainless steel stock pot, combine all ingredients, less the lemon juice, and bring to a boil on medium-high heat. While stirring, allow to gently boil for 5 minutes to thoroughly blend each flavor. Jar Prep: B ecause we are hot packing the basil tomatoes, be sure your jars have been resting in hot water in the sink. Just prior to hot packing, add lemon juice to each empty hot jar: 1 tbsp for pints and 2 tbsp for quarts. Add hot basil tomatoes using a slotted spoon, ensuring each jar has a generous 1” head space. Ladle in juice from the mixture being sure to maintain the 1” head space. Wipe each jar rim and screw band with a warm wash cloth prior to securing lids and rings. Place sealed jars in your pressure canner. Process jars at 10 pounds of pressure, 15 minutes for pints and 20 minutes for quarts. After processing time has been reached, turn off the heat. Allow the pressure in the canner to reach zero on its own, which usually take about 30 minutes. 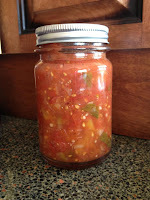 Remove canner lid and allow jars to set for 10 minutes inside canner. 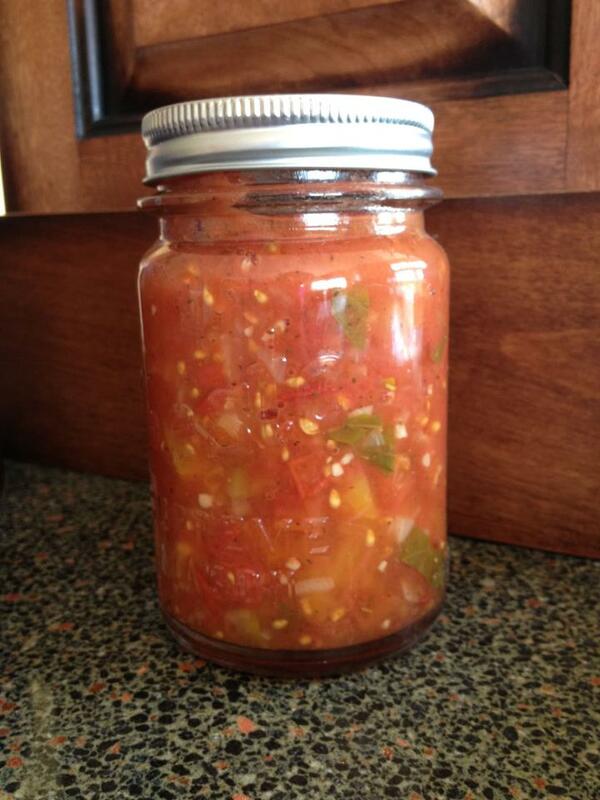 Remove jars to a draft free location in your kitchen to cool down completely before storing. Pressure Canner Lid Removal Tip: When removing the pressure canner lid, tilt the lid up and outward so that the lid is used as a shield to protect your face and hands from the steam. Hold the lid until all the steam has dissipated. Take a step backward and set the lid down in a designated area. DO NOT rake the lid and your hands over the top of your pressure canner – especially while steam rises from the canner!!! I learned the lid removal process the hard way!! Steam burns! Is this recipe good for water bath canning? If so, how long do you process quart jars? Thanks! This recipe, giving the acidic value being lowered by adding additional vegetables and fresh basil, must be pressure canned. It is only a short period of time required in the pressure canner – 15 minutes for pints and 20 minutes for quarts both at 10 pounds of pressure. will have to try this with my tomato crop this year.